Celebrity cricket league aka ccl coming with lot of specialties, this edition having 6 teams. CCL T10 Blast having 10 overs for one side, 90 minutes of action. Bengal Tigers, Kerala Strikers, Chennai Rhinos, Karnataka Bulldozers, Telugu Warriors and Mumbai Heros are the teams playing 2017 editions of ccl. Sun network and sony espn holding telecast rights of CCL T10 Blast. Sun network movies channels in regional languages will air the live telecast. surya movies, ktv, gemini movies and udaya movies channels started showing promos of CCL T10 Blast. Karnataka Bulldozers is our team, first match is against Kerala Strikers and second match vs Mumbai Heros. each team have 2 league matches, there are only 7 matches in total including finals. Opening match is between Bengal Tigers and Chennai Rhinos. Telugu Warriors vs Bengal Tigers, Mumbai Heros vs Kerala Strikers and Telugu Warriors vs Chennai Rhinos are the other matches. Udaya movies is available through all leading dth and cable networks. ccl lovers can also enjoy matches through sony espn channel. 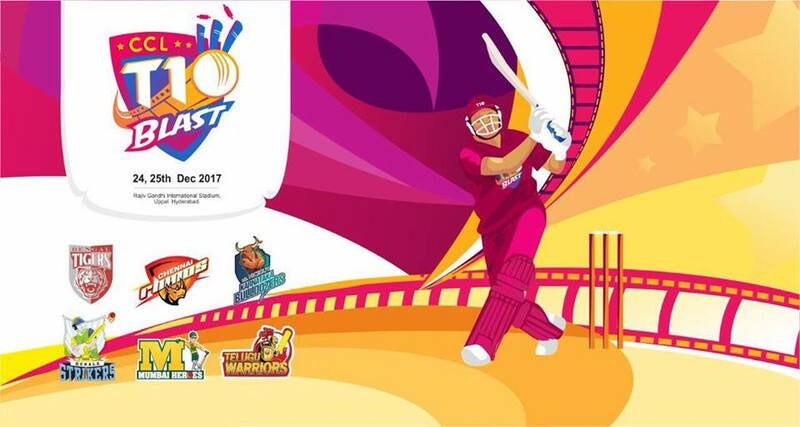 24th December and 25th December are the dates, Hyderabad is the venue for Celebrity Cricket League 2017. Keep watching ccl live coverage only through Udaya movies, sun nxt application and sony espn channels. support your favorite celebrity team and enjoy all cricket matches.